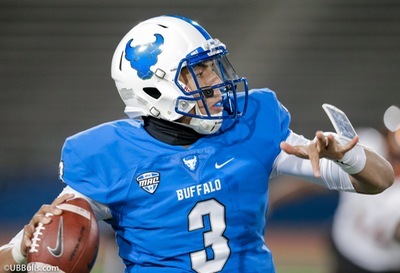 This past weekend, UB’s Tyree Jackson was one of the quarterbacks for the South team in the Senior Bowl in Mobile, Alabama. It was a big chance for the Bulls star to strengthen his case for the NFL, and another opportunity to impact when he’ll be drafted. He would up being the South team MVP after completing 13 of 21 passes for 165 yards and two touchdowns. His 54 yard pass to West Virginia’s Gary Jennings was the longest pass of the game. Jackson’s stats were better than any of the other Senior Bowl quarterbacks. Jackson is the first UB player to enter the NFL Draft early. He graduated in December with one more year of eligibility left, but decided to make the move to the NFL. Part of that decision likely was based on a muddled quarterback position in year’s draft class. It’s not like last year, when five QB’s went in the first round and everyone pretty much knew that would happen and which ones would be picked. Jackson is banking on his Senior Bowl week, the Scouting Combine, his Pro Day and his team visits to climb up the boards. But how high can he climb? That may have more to do with how the NFL now drafts quarterbacks as it does his arm strength, accuracy and decision making. Right now, most “experts” think that Jackson is a 3rd or 4th round pick. That’s exactly what Senior Bowl Executive Director (and former NFL scout) Jim Nagy said this week. Why not higher? Concerns about his accuracy, release, decision-making and non-Power 5 competition are cited. But he’s a six-foot-seven, 249 pound, mobile, strong-armed athlete who was the MAC’s offensive player of the year. Can he move up to the second round? Maybe. But that’s the point of this column. The NFL has established a way of drafting the position, for a number of reasons. The prominence of the position has vaulted almost any talented quarterback prospect into the first 32 picks. It makes sense. All teams value the position so much that if a prospect has most of what a team wants, it won’t wait to take a potential starter at the game’s most vital position. If a team sees a prospect as a starter (now, or soon), it will make that pick in the first round. This number makes sense, based on the position and need. Maybe some of those 16 players went higher than some thought, but no NFL team will hesitate if it thinks that QB can be a future star. At this point in the scouting process, there’s a thought that only a few QB’s will go in the first round. Ohio State’s Dwayne Haskins seems to be the top choice. Maybe Oklahoma’s Kyler Murray and Duke’s Daniel Jones will go in the first 32 picks. I would bet there will be more. Maybe we don’t know who else yet, but there is such a value on the position that another two or three wouldn’t be a surprise. All first round picks sign four year contracts, with a team option for a fifth year. That’s huge cost control measure for teams. Especially for quarterbacks. Delaying a year before having to pay them approximately $20 million dollars is huge. That’s why the Ravens traded up to the 32nd (and last) spot in the first round to pick Lamar Jackson. It’s why the Vikings did the same thing to take Teddy Bridgewater in 2014. The difference between the 32nd pick and the 33rd can be millions, especially if it’s a QB. So look for teams to continue to be aggressive in taking a QB in the first round. As more general managers with salary cap backgrounds get the final say, the cost factor of a first round quarterback will become more important. This is the draft’s quarterback wasteland. I was shocked when running the numbers to see that teams just don’t use second round picks on the position. Yes, that’s right. Only four taken in the second round. DeShone Kizer (Cleveland), Christian Hackenberg (Jets), Derek Carr (Raiders) & Jimmy Garoppolo (Patriots) are the only ones. Hackenberg was such a reach pick, among the worst in the last five years, that I don’t even want to count it. Last year, there were none taken. Same for 2015. Why? I asked two longtime NFL scouts to clarify the surprising results. They said that if a team likes a quarterback and sees him as a future starter, they’re going to take him in the first round. If not, they’re going to wait. A second round pick has to be a player who contributes right away. If that’s a QB, he’s going in the first round. If a QB doesn’t project as a lock future starter, then the team is going to wait and take a player who will step right in. That thought process factors into the grading process, too. It’s not a coincidence to me that so few are taken in the second round. So when you see a QB projected to go in Round 2, pause on that. Here’s where the QB selections pick up, slightly. But not as much as I expected. That’s not a lot. The list of names is pretty ugly, and maybe that’s why. All but one were picked in the bottom half of the third. None are current starters. Four of the seven are no longer with the team that picked them. Garret Grayson and Davis Webb weren’t even in the league last year. Sean Mannion will play in the Super Bowl as Jared Goff’s backup. This tells me that teams reached for these players. They needed a QB, but weren’t ready to use a first round pick on one. This group had some talent, but not enough to elevate them. There was not a high expectation from the teams that picked them that any of these would become starters. That proved to be right. The draft’s middle rounds continue to be a barren wasteland of QB selections. It doesn’t get any better in the fourth round, with one exception. One more than the third round. Dak Prescott is the only one who has become a starter. They only 3rd or 4th rounder to have any success. The Bills took Cardale Jones in this round. He’s gone. They actually have one of these picks. But he’s now TIGHT END Logan Thomas. This continues to show how the league sees the position in the draft. Take a top prospect in the first round, and everyone else who projects to be a backup gets basically ignored in rounds 2-4. Beyond that, it’s taking flyers on prospects with a few skills like big arm, mobility or smarts. But if they have any combination of those skills, they’re gone by now and probably picked in the first round. The short answer is…not many teams. With half of the league taking one in the first round in the last five years, there just aren’t many teams with a crying need for a QB. With the potential of veterans like Bridgewater and Joe Flacco on the free agent market, most of the starting spots are filled. But there is one group of teams that might be QB shopping. The teams looking for the next one. Is this the year that the teams with aging veterans get their future leader? Will the Saints get Drew Brees replacement? Will the Chargers find the next Phillip Rivers? Green Bay and New England may be willing to go there. This is where 2019’s QB market will come from. What Does It Mean For Tyree? He needs to do everything he can to convince a team he has starter potential, and try to get up into the first round. Because beyond that, his odds look long. Now remember, it only takes one team to fall in love with his freakish size and skills. That could happen. I think there’s a better chance of it happening to Jackson than to the group of middling prospects like Will Grier, Jarrett Stidham or Gardner Minshew. None of them seem to have the upside that Tyree does, because of his size and arm strength. He did enough at the Senior Bowl practices to warrant a lot more examination and buzz. The NFL drafts high based on physical skills and potential. Remember, not many were talking about Mitchell Trubisky or even Patrick Mahomes as lock first rounders in January of 2017. So it could happen. But if it doesn’t, then Tyree may have to reset expectations and hope a team sees enough to use a third or fourth rounder on him, and buck the history I’ve laid out. Another challenge will be his roster spot. If he’s taken beyond the first round, then that team probably would need to carry him as a third QB, thinking he isn’t quite ready to be the backup. About half the NFL teams only carry two QB’s. That’s a pretty big commitment. Having watched Jackson’s development through three years, I’ve always thought he has a chance to play in the NFL. There just are very few humans with his size and skills. NFL scouts that came to Buffalo this season were overwhelmingly positive. I know that firsthand. Scouts look for the skill set. That’s what they do. That’s what they saw. Now it’s up to Tyree to show teams how smart he is, how fast he processes information and how much he can clean up those negatives. He’ll work with QB guru Jordan Palmer in California to do just that. The last Palmer project with outstanding physical skills, accuracy questions and small school competition concerns? Every Bills fan knows that answer.